Review: Underneath the mishmash of electronica and synth that joins the piano, woodwinds, and strings in Yugo Kanno’s score for PSYCHO-PASS, one finds an aura of tragedy that drapes over the anime like a heavy curtain. This stifling image that Kanno evokes through his music aligns well with Gen Urobuchi’s screenplay for the anime which depicts a grim future where the need for societal harmony strips people of the very essence of what it means to be free. Order is enforced through the Sybil System, a sinister AI (or so we are led to believe) which governs nearly every aspect of a person’s existence by scanning and analyzing their state of mind through psychological scanners present at every light pole and street corner. “PSYCHO-PASS” wastes no time in getting under way. The rhythmic blast that marks the track’s beginning races along with an urgent purpose. But just when you think a clash is imminent, the piano’s plaintive layering on top of the rhythm betrays the tragedies that are sure to come, creating an engrossing duality. This lamentation is heightened further by the inclusion of the violin which sighs mournfully, ebbing, flowing, lilting, all to bring out the desperation as the very pillar of societal order shows its weaknesses. So while the forceful electronica dominates the track’s foreground to suggest action, the scant hope, sprinkled in the prominent motif heard in the string and electric guitar duet, brings out the profoundness of the tragedy which envelopes much of the series for all to hear. The second track, “The Gunpoint That Controls The Justice” is as somber as the dissonance leads the way. If the violin motif’s grim upwelling early on isn’t enough to reinforce how ominous the world is, the distant lilt from a singer and the synthy muted blares set the foundation for the uneasy atmosphere. But it’s the strings in the second part of the track where the music becomes poignant as tragedy and hope intermingle. Though not wholly complex, the broad strokes that it paints is engaging, matching the grim setting pound for pound. Kanno’s electronica sets the foundation for this dystopian future as it weaves an unsettling fabric that’s slowly fraying in spite of the Sybil System’s raison d’etre. Tracks like “Crime Coefficient” only further the aural setting and the pace of the anime by amplifying the unease into full-blown paranoia. “Crime Coefficient” buzzes with an unwavering resolve, barring a few interruptions including menacing crescendo blasts and ostinatos which heighten the suspense, evoking images of one darting through endless urban alleyways filled with lurking dangers. Although the track is tense, it’s the eerie, disjointed piano segment that cracks the veneer of sanity with lingering tones that agitate listeners. Perhaps the only track more vivid in this spiral towards madness is “Obsession,” which starts out with a few blips and bloops before unleashing a grating, pulsating blare that persists like a jackhammer between one’s temples. While the way it drives on lives up to its track title, “Obsession” is an effective mood-setter that’s unlikely to garner repeat listens. Amidst the electronica, Yugo Kanno proffers some funk and harsher acoustic guitar tones to give PSYCHO-PASS the mood of a modern film noir. “Unit One of the Public Safety Bureau’s Criminal Investigation Division” delivers with a strumming bass to lay out a chaotic air that’s oddly pleasant if less methodical than what one would expect from a government agency. While short, the track’s spontaneity is enjoyable as it tugs listeners along its funky grooves. There’s also “Dominator,” which uses a huffing sound to simulate the tension one might get out of a chase before a stimulating, heavier outlaw-ish country sound takes over, providing the track with much of its energy. The heavy beats continue to run its course, adding an array of electronica to intensify the tension along with a brief segment of silence where the suspense grows. But as much as the unease dominates the soundtrack, it’s the melodies that bring out the tragedy in such stark terms that stand out the most. In “Human Mind,” the piano comes forth reticently. Though its motif is calming and serene, the way the piano rustles exudes a sense of pain and anguish resulting from the loss of what it means to be human. The soft tone feels muted at times, making it a good reflection of an existence bereft of the ups and downs that encompass life’s joys and sorrows. “The Way of Life” fits the same mold as the slow melody issues forth and unveils a deep mourning within. The sorrow comes out plaintively from both the piano and cello, lamenting for the innocence lost. Hope here is fleeting and the melancholy is sublime amidst the broken backdrop of the anime. 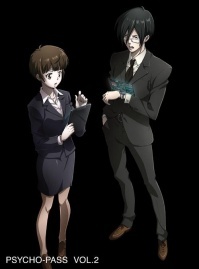 All told, the way Yugo Kanno’s PSYCHO-PASS soundtrack slithers through its digital labyrinths is absorbing as it tells a tale of ideals breaking down in the light of the truth, making the tragedy that unfolds on screen that much more pronounced. For much of the ideals that the characters hold are converted into action to defend the Sybil System from those who would seek to destroy it, and Kanno’s intense electronica evokes the desperation behind the action wonderfully. But it’s the tragedy that shines most, building the emotive foundation for Gen Urobuchi’s dystopia, where, given what happens, the characters have no other suitable recourse than to cry soft, bitter tears as their world altogether crumbles. Your openers for the reviews are great as usual ZZeroparticle. You’re right about the ‘Obssession’ track. I felt like someone jammed a bunch of needles into my ears when I played it. Luckily, I don’t think they ever played it in the show itself. I also don’t remember listening to ‘The Gunpoint That Controls The Justice’. Wish the story was as sublime and subtle as the OST. Too bad Gen and subtlety don’t mix together well. There are way too many plot contrivances in the show to truly enjoy it to the fullest extent. Gen’s persistent crutch is that he merely wants to get his point across even if he has to shove it down our throat. Anyway, I’m looking forward to your reviews for the opening and ending songs of PSYCHO-PASS. It’s difficult to rate certain contextual or dialogue-paired tracks for stand-alone listening merits. Many of the more ambient or chaotic tracks might fit certain styles of scenes well, especially given the dark, “cyberpunk” mystery/detective setting, but wouldn’t really stick on ye average audiophile’s “background instrumental” sorts of playlists. In spite of the difficulty in rating music that comes with contextual baggage, I still found Psycho-Pass’s soundtrack to be enjoyable all around even absent the context. I’m not sure whether the melodies trigger memories of the anime or what, but compared to a lot of other aural ambient OSTs, Psycho-Pass is a notch above. At least I didn’t get fidgety or impatient like I normally would with such fare. And yes, if there’s something I’ve noted from listening to a lot of Yugo Kanno, it’s that his main themes are fantastic. Sometimes I wonder whether buying a CD filled with all of his main themes from anime/J-dramas/movies would be all I need since he does them so well! That’s surprising, I didn’t expect to enjoy the soundtrack, but the tracks you’ve used here are quite good. In the series itself at least I didn’t really hear the music (except for the Dominator soundtrack (which was never used during an action scene, sadly)). Such a shame when the soundtrack is this good. The surprising thing I found is that once I started listening to the soundtrack, I started paying more attention to the music in the anime. It helps me to know what sort of musical cues to keep on alert for in any case.